Billy Mitchell had been an officer in the United States Army for eighteen years before he took his first flight in an airplane in August 1916. An immediate convert, he promptly transferred to the recently formed air arm and became the senior air officer when the United States entered WWI in April 1917. Pilots had captured the public’s attention, so Mitchell returned to the United States a general and a hero. Although he considered himself to be the most qualified candidate for the position of director of the air service, his abrasive nature had made too many enemies, so he had to settle for the position of deputy director. When a squadron of bombers under Mitchell’s command sank a German battleship during a test on July 20, 1921, it signaled that battleships no longer ruled the seas. 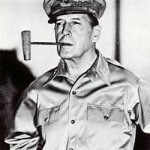 Although his expertise and uncompromising attitude had won him many supporters, Mitchell’s ridicule of anyone who disagreed with him and his very public criticism of the War Department’s attitude towards air power caused his superiors to finally lose patience. When his term as deputy director ended in 1925, it was not renewed and he was transferred to Fort Sam Houston in San Antonio, Texas. Unhappy to be exiled from Washington with its access to the national press and political elite, Mitchell refused to meekly accept his fate and planned a return to Washington. If necessary, he would leave the military to pursue a career in business, politics or writing. The peacetime military was given a very limited budget, therefore the army and navy competed for resources. The senior generals and admirals were united only by contempt for the upstart pilots in their respective services, who sought a share in the increasingly strained defence budget. When the US Navy Airship Shenandoah crashed during a publicity tour of the mid-west on September 2, 1925, Mitchell was aware that the airship had been given a dangerous mission simply to upstage the air service, and fourteen men had died as a result. Angered by the senseless tragedy, he released a carefully prepared statement on September 5, blaming the crash on “the incompetency, criminal negligence and almost treasonable administration of the national defense by the Navy and War Departments.” The statement attracted a huge wave of public support but the military leadership refused to let the direct challenge pass, and the lengthy court-martial would dominate national headlines. In 1921, admirals of the US Navy, congressmen and foreign dignitaries gathered to watch Mitchell demonstrate his claim that aerial bombing can sink a battleship. He is proven correct but only by using heavier bombs than were permitted by the rules of the test. Offended by the upstart air service, the commander of the army, General John Pershing, removes Mitchell from his position as deputy director of the air service, demotes him and transfers him to Fort Sam Houston, far from Washington. Although hurt by the severity of the punishment, Mitchell remains loyal to the army and continues to lobby for more resources to be devoted to the air service. However, his loyalty is shaken by the death of a close friend, Lieutenant Commander Zachary Lansdowne, whose airship, the Shenandoah, crashes during a publicity tour of the mid-west. Angered by the senseless tragedy, Mitchell makes a statement to the press, blaming the crash on “the incompetency, criminal negligence and almost treasonable administration of the national defense by the Navy and War Departments.” Aware that public criticism of the military will probably result in his court-martial, Mitchell is willing to risk his career to have his day in court, where he will publicly argue on behalf of a separate air force. Realizing that the single defence lawyer appointed by the court will not be enough, Mitchell reluctantly asks Congressman Frank Reid, a fellow believer in air power, to represent him. Unknown to Mitchell, the army’s senior leadership has no interest in letting him have his day in court. 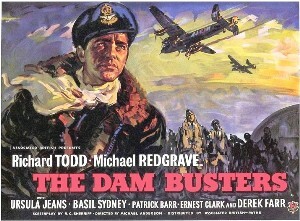 The script repeatedly stretches the truth, particularly during the bombing test to sink a battleship. There is no mention that naval fliers also took part in the exercise. Admittedly, the exercise was deliberately designed to make it difficult for the bombers to sink the battleship but Mitchell was not directly forbidden to use 2,000-pound bombs, so the whole moral dilemma about whether to disobey orders is a figment of the script writers’ imagination. Furthermore, Mitchell did not actually fly during the bombing run. Although it is true that the senior admirals and generals simply did not understand air power, the debate ended when the real ship sank beneath the waves. The actual Mitchell did not lose his position as deputy head of the air service with a transfer to Fort Sam Houston immediately after the bombing trial, but because his public criticism of the army through speeches and articles was insubordination. Mitchell was not friends with Lansdowne. In fact, Mitchell did not have close relations with any of the naval fliers, since he preferred to mock them, even those who supported his ideas, which did not win any support from the navy. It is true that Lansdowne was sent on a publicity tour of the mid-west, including state fairs, but he did not oppose his orders even though he was aware that the frequent storms at that time of the year made flying dangerous. The most serious problem is that the script was tailored to match Gary Cooper’s star persona as a noble man of the people. Unlike the screen Mitchell who is uninterested in his career and will plead guilty to get his day in court, Mitchell spent more time planning how to use the publicity to launch a new career than preparing his defence. In order to reinforce the image of a lone crusader for justice, the film shows Mitchell arriving in Washington by train to be greeted by two officers officially informing him that he is being court-martialed, instead of the hundreds of supporters that were waiting for the real man. The most laughable part of the movie occurs when Mitchell states that “Politics and the army don’t mix” when he is lobbying the army. He even refuses to let Congressman Reid launch a press campaign, since he only wants to change the army’s attitude towards air power not embarrass it. The real Mitchell was a seasoned political operator, who routinely used the press to lobby legislators and public opinion for air power, not a naive, well-intentioned neophyte. Aside from changing Mitchell’s personality and boundless ambition, any inconvenient facts are tossed into the wastebasket. Cooper’s insufferably noble Mitchell gallantly refuses to challenge any members of the jury as being biased against him. Actually, he challenged and removed three members of the jury in a cynical attempt to increase the proportion of jurors believed to be favourably inclined to him. The price of preserving Cooper’s image is the erasure of Mitchell’s entire personal life, probably because it would reduce sympathy for the character. Mitchell is presented as a brave, determined champion of air power, with few personal attachments and an almost monkish lifestyle, who spends his leave in Washington lobbying generals. In fact, he was divorced and had married a woman who strongly resembled his first wife but was eleven years younger. More important, the genuine Mitchell lived such an extravagant lifestyle that he was constantly juggling debts, despite generous support from both his family and his in-laws. The large defence team was paid for by his father-in-law. The script devotes a great deal of time to the army’s refusal to permit Mitchell to call witnesses in his defense, until Reid finds a way to change the jury’s mind. Actually, the whole point of the case was whether the accusations in Mitchell’s 6,500-word-long statement could be proven, not had the accusations been made. It is true that the Navy did try to stop Lansdowne’s widow from testifying, but it was at her husband’s inquest, not during the court-martial. Her testimony that Lansdowne kept delaying in hope that orders would come to stop the flight is untrue, she did not say it and he did not delay it. Congressman Reid is given a huge role in the film and may even have had more screen time than Cooper. Although shown as a friend of Mitchell and a fierce advocate of air power, the actual congressman had little if any interest in air planes, and agreed to serve as Mitchell’s defence attorney simply because he thought that the press coverage would be good for his political career. Despite the movie’s title, the real testimony only started 70 minutes into the 100-minute-long film and lasts a mere five minutes. While the testimony of celebrity witnesses like WWI ace Eddie Rickenbacker and Congressman (later mayor of New York City) Fiorello La Guardia did make the prosecution look stupid, better lawyers were brought in, and they pointed out that the witnesses could not support their testimony with proper facts. In the movie, Rod Steiger’s sharp yet nasty prosecutor is brought in solely for Mitchell’s testimony. In yet another unnecessary attempt to maintain Cooper’s heroic image, his character testifies even though he is suffering from a malaria attack. While the real Mitchell had contracted malaria while serving in the Phillippines, he did not suffer any attacks during the trial. Unlike the repulsive attacks on the screen Mitchell’s character, the real prosecutor easily disproved Mitchell’s broad statements. The real Mitchell’s constant refusal to actually prepare for his testimony meant that he gave an embarrassing performance. Steiger ridicules Mitchell’s ideas about parachute troops, three separate services and an attack on Pearl Harbour. The film shows his predictions that were proven correct but chooses to ignore the many predictions that were proven completely wrong. Most important, he did NOT predict an attack by enemy aircraft carriers on Pearl Harbour. The real Mitchell thought that the Japanese would seize a nearby island and then launch the attack. The trial was a sensational event, the O. J. Simpson trial of its time, so it is frustrating that the movie does not show the effect that the trial had on the nation. Otto Preminger’s direction is lifeless, as if he had no interest in the project. Rod Steiger does give a masterful performance and his speech is silkily hypnotic. Gary Cooper’s screen persona of a selfless man of the people made him completely unsuited for the role of the abrasive gloryhound Billy Mitchell. This may have been Cooper’s most relentlessly noble film and was quite the contrast from his performance as a ruthless schemer in Vera Cruz the year before. Even Mitchell’s family hated the movie, feeling that James Cagney would have been a better choice. Mitchell’s son Billy Jr. met with Cooper and was not happy to learn that Cooper had little interest in basing his performance on the actual Mitchell, since the studio paid him to be himself in front of the camera. 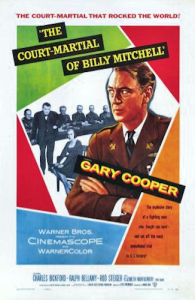 The decision to rewrite Billy Mitchell’s court-martial to ensure that Cooper would not have to actually act deprives audiences of the opportunity to observe a key trial during the Interwar years. Thank you for another revelation. Most people, including myself, simply took the film at face value. There’s no substitute for this kind of insightful and knowlegable analysis of movies when it matters, as it does to me, whether I’m looking at fact or fiction.